I have an addiction. I think I actually have a lot of addictions: Reading, movies, TV shows. Nothing life threatening, mind you, but definitely addictions. But one particular addiction has been on my mind lately. 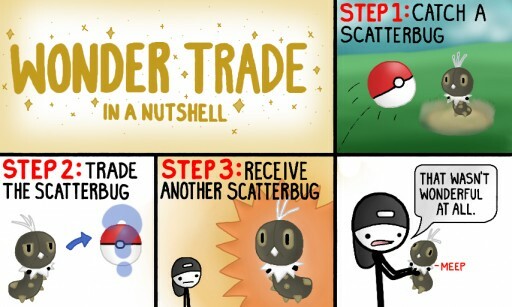 The Pokemon games have a feature now called Wondertrading. And I am highly, HIGHLY addicted to it. 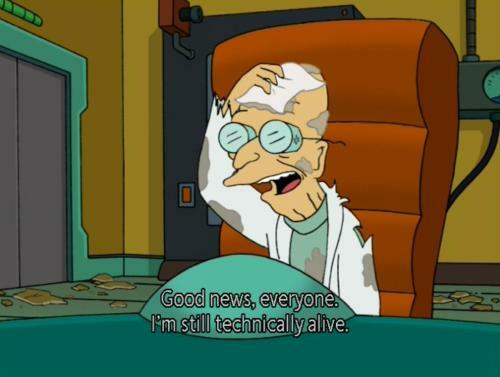 Yes, everyone, I’m still alive! Even better news: I’m almost done with my thesis! Well, technically, I’m completely done writing it. Now I have to go in to defend it and either pass or fail. I either get to graduate this semester or I don’t. Here’s hoping it’s the former! I apologize for my lack of frequent updates so far this year, but I hope to have more time on my hands from this moment forward. Technically, I AM starting to look for my first job, but I should still be able to write at least 1 blog a week. I could talk about how I’m nervous about job hunting, how I’ve never had a job before, blah blah blah. I’m sure none of you really want to hear about that. Instead, I’m using this blog to assure you all that I am, in fact, not dead. I’ll hopefully have a more substantial (ie FUN) blog to post later on in the week. I haven’t done a Top 10 in a while, so maybe I’ll do one of those. In any case, I’ll see you all next time! This may be my shortest blog yet. Wow.